Sober Look: The Ukrainians learning from Greece about "debt restructuring"
The Ukrainians learning from Greece about "debt restructuring"
The Greek PSI restructuring is giving some indebted nations an idea. Debt restructuring is very doable. Debt holders? That's OK, they will be back. Plus who needs them anyway when you have the IMF, which is easier to push around. One nation that is thinking about taking this route is Ukraine. Bloomberg: Ukraine invoked Greece’s record debt restructuring in a bid to stave off repaying $3 billion to the International Monetary Fund as Standard and Poor’s warned of funding risks and cut the country’s rating outlook to negative. First Deputy Economy Minister Vadym Kopylov cited last week’s “huge” deal between Greece and holders of its bonds, saying Ukraine may seek a 10-year delay in repaying the IMF under a $16.4 billion rescue program granted in 2008. The lender said it hasn’t been asked to reschedule payments. Recently the Ukrainian government decided to increase spending on social programs by at least 1.2% of GDP above what was targeted in the budget as part of the original IMF financing. This is how politicians get reelected (not much different than in the US). A couple of weeks ago Prime Minister Azarov also said that Ukraine should receive new IMF financing - just because... The new funds would be used to pay interest on the 2008 loan. Of course the IMF didn't go for that proposal. Now the Ukrainians are having a tough time negotiating natural gas purchases from Russia and may end up buying gas elsewhere. They are looking to get sizable discounts because the nation is running out of funds. Given that the Russians control most natural gas supplies in Europe, it's not exactly clear where Ukraine would be buying it from. And as before, the Russians could simply turn the spigot off. If that were to happen, the Ukrainians would have other things to worry about than the $3bn IMF payment they need to make this year. 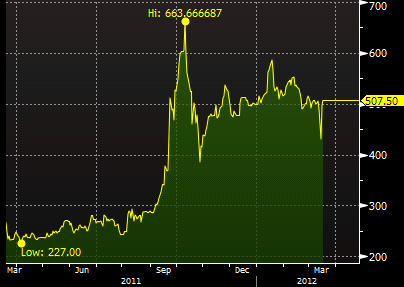 Ukrainian CDS widened last week to 757bp. This is far above the Markit iTraxx SovX CEEMEA index of sovereign CDS, which comprises of 15 emerging markets names in the Central and Eastern Europe, Middle East and African countries (a good benchmark for emerging markets CDS). The chart below is the spread between Ukrainian CDS spreads and the SovX CEEMEA index. Max Alier, who heads the IMF’s office in Ukraine, said yesterday that the fund has no “mechanisms to restructure or reschedule payments” and hasn’t received “any requests” from the government to do so. No mechanism to restructure IMF debt? That's too bad, because that's exactly what the Ukrainians may be intending to do. After all they've learned from the best in the debt restructuring business.